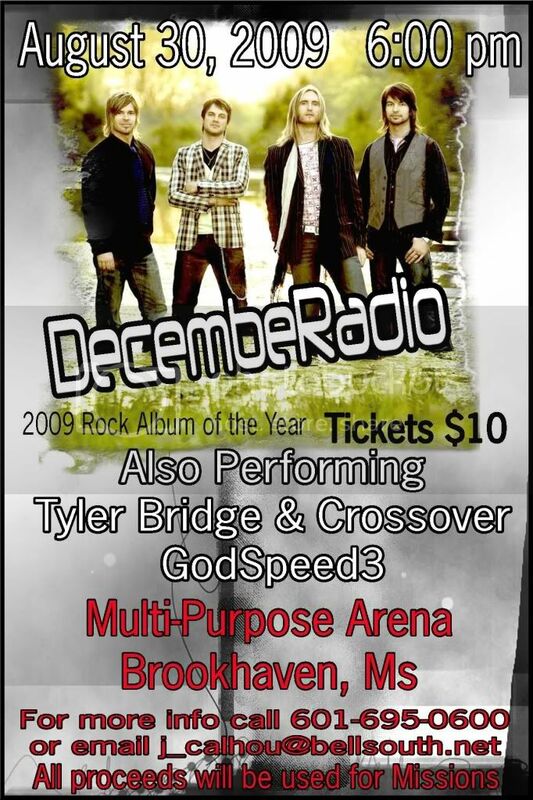 Brookhaven UMC is hosting DecembeRadio this Sunday, Aug. 30th, at 6 p.m. at the Multi-Purpose Arena in Brookhaven, Miss. Proceeds from this concert (tickets are only $10!) will help us finish Mama Yoli’s House. DecembeRadio won the 2009 Dove award for Rock Album of the Year. We hope you come out to enjoy this Christian concert and support SIFAT in the process. The address for the venue is 1096 Beltline Road, Brookhaven, MS.
Tickets are available at the gate. For more information, call (601) 695-0600. Is your group hosting a SIFAT fundraiser? We’d love to help get the word out by posting an announcement here. Contact Marie, lanierm@sifat.org, for more information.